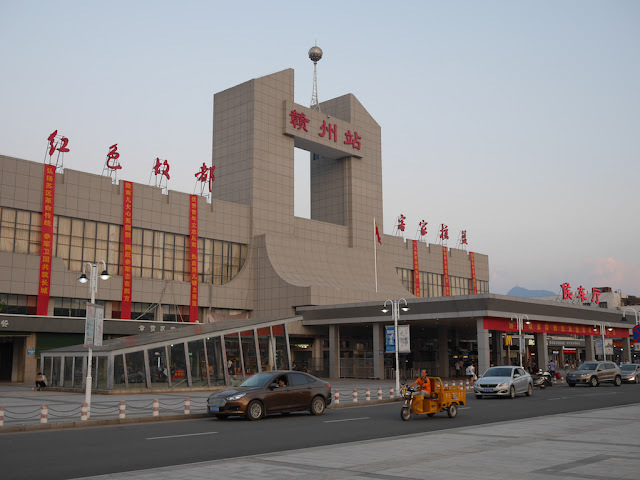 Five years ago when I first travelled to Zhuhai by intercity high-speed rail I could only make it as far as the Zhuhai North Railway Station, from where I took a high-speed taxi. 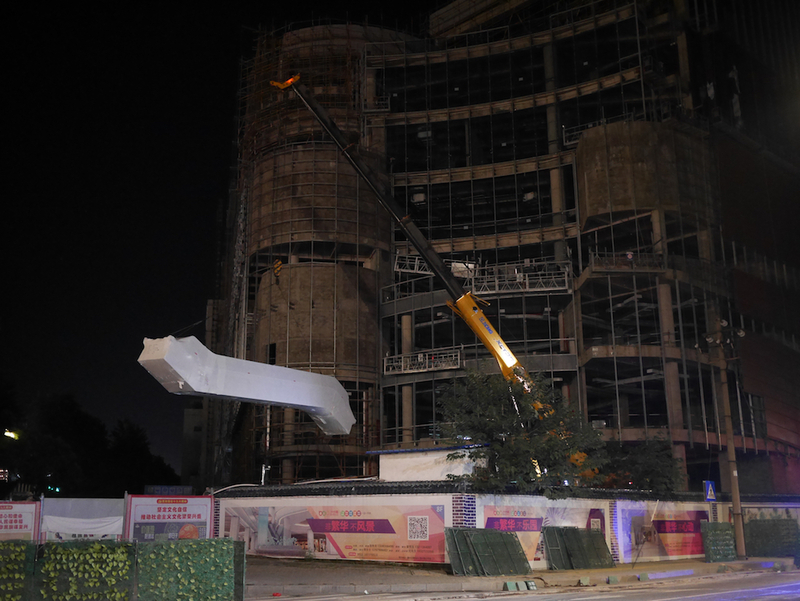 But now the high-speed rail line reaches all the way into Gongbei at the border with Macau. 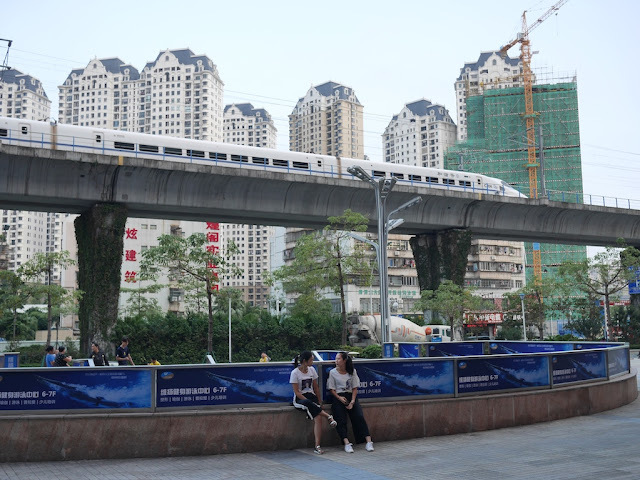 Today in front of the Chengfeng Plaza (诚丰广场) shopping mall, I saw a train pass by. The trains don't move at a high speed through the city. This makes photos a bit easier, though presumably that's not the main motivation. 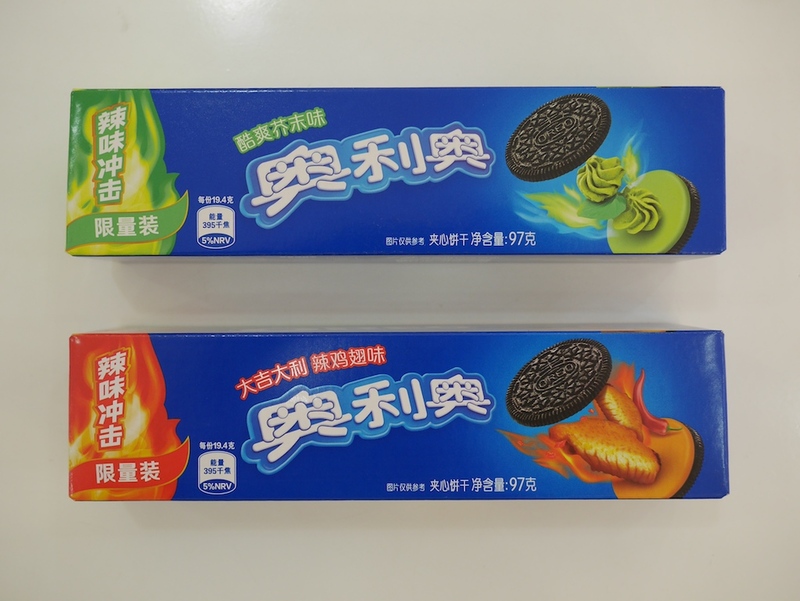 Nearly a month ago I first heard about the introduction of two new Oreo flavors in China — Hot Chicken Wing and Wasabi. The news provoked some strong reactions in the Western world, and several of my own friends in the U.S. shared stories about it. One wrote, "No!! Stop it!! What did the Chinese ever do to you, Nabisco??" Nabisco probably can't be blamed (or commended) for this one though. While Nabisco produces Oreos in the U.S. for its parent company Mondelēz International, it doesn't make them for China and many other countries in the world. 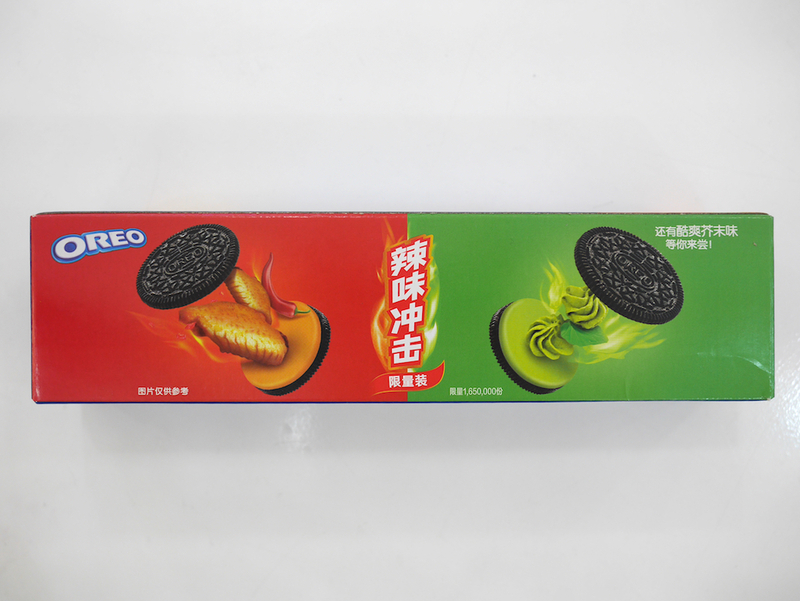 Initially I had hopes for the Wasabi Oreos due to positive experiences in the past with chocolate with spicy red pepper. Hot chicken wings seemed rather peculiar, But then a friend reminded me that there is chocolate in the sauce for chicken molé, and that is good stuff. She had also just made chocolate chicken chili, which is now on my list of things to try. I now had higher hopes for the Hot Chicken Wing Oreos. Additionally, the new flavors were of interest given my interests in how Western companies localize their products and services in China, and I have tried other Oreo flavors in China in the past. For example, six years ago in Shaoxing I tried Peach-Grape Oreos. They weren't my thing, but presumably other people feel differently because they are still available. Then three years ago in Hengyang I tried Lemon Cheesecake Oreos. I liked them a lot more, and they're still around too. So I was ready to try the new flavors. However, there was a problem. After checking more than five large supermarkets in Ganzhou — including a Walmart — I came up empty. They all sold Oreos, but they didn't have these two flavors. 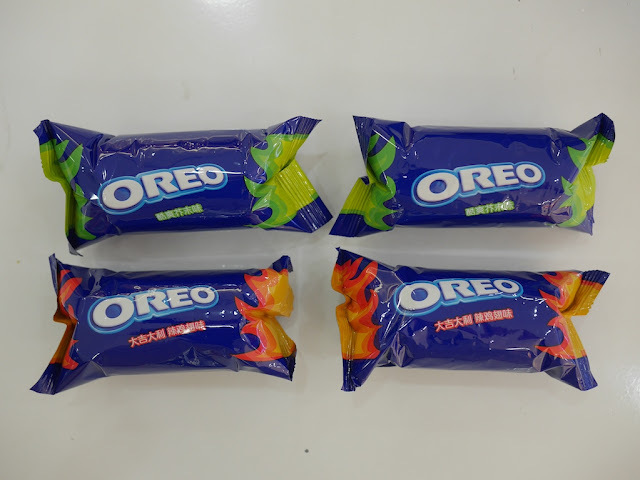 Although I occasionally revisited the supermarkets, I expected I would have to wait much longer or switch cities before finding Oreo spiciness. Recently, I left Ganzhou and am now in Zhuhai. Yesterday, I went to a Vanguard supermarket and finally found the new flavors. But they only had giant-sized boxes, and that was far many more Oreos than I wanted. After that I went to a Walmart. Their selection was rather uninspiring, and they didn't have the new flavors. So then I headed to the place I had thought would be my best bet here — Carrefour, a French hypermarket chain. 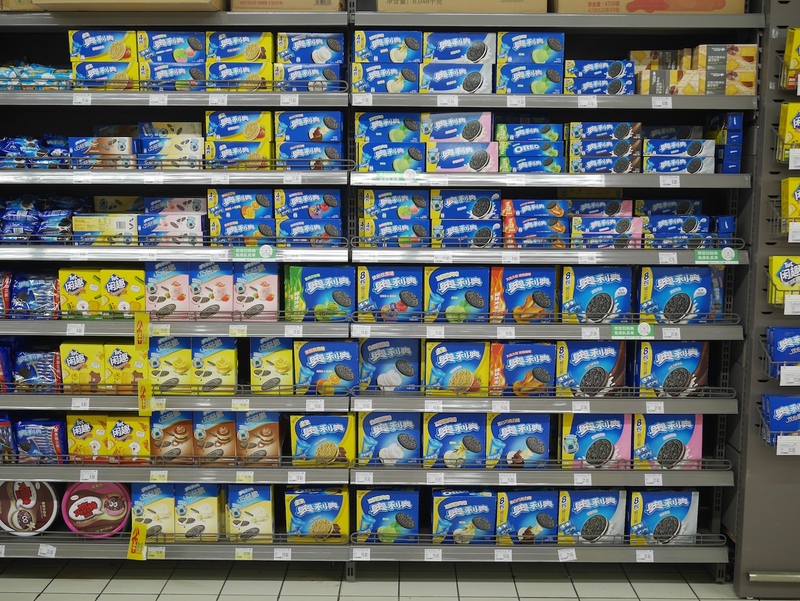 Yes, the Carrefour in Jida, Zhuhai, indeed had a wide selection of Oreos. And yes, my search was over. Soon I had two fine boxes of spicy Oreos in my possession. Each box of 10 Oreos had a price of 5.8 yuan (about U.S. 85 cents). I tried sharing my excitement with several other people shopping at Carrefour. As far as I could tell, they didn't understand why I was so happy, but they at least seemed happy I was happy. Based on this information, the Oreos have equal nutritional value. So being on a diet probably wouldn't affect a choice of one over the other. 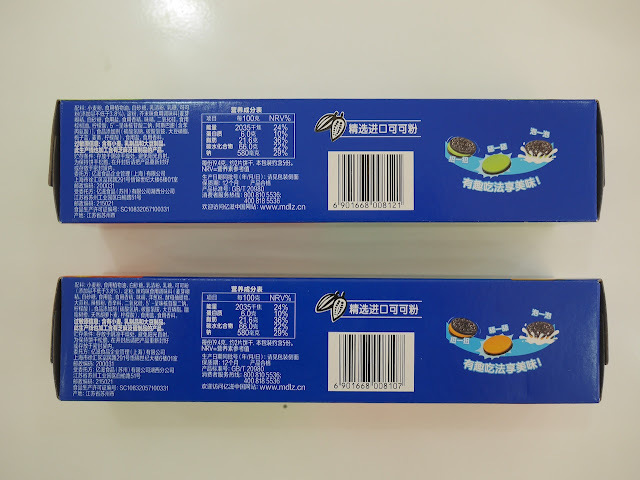 Also, the Oreos are made in Suzhou — a city in Jiangsu province bordering Shanghai. Suzhou has many canals and presumably many Oreos as well. Opening the boxes reveal they both held two pouches of cookies. If I didn't like them, I could easily give half away. If I did like them, half would stay fresh longer. I call that a win-win. Now the moment we have all (or at least I have) been waiting for: the test taste. I thought about this a lot (too much), and I will start with the Hot Chicken Wing Oreos. Prelude: a sip of milk, of course. Huh, um . . . it's more like a hot pepper flavor Oreo. Or maybe more of a barbecue potato chip Oreo. I feel like it is flavor-shifting, but at no point do I taste a chicken flavor. It is . . . different. I like it more than the Peach-Grape Oreos. I'm not at all a fan of the Peach-Grape. Now I will just try some of the filling on its own. That is . . . odd stuff. It isn't sweet. I liked how it worked with the chocolate wafers much better than on its own. If I had tried the filling without knowing what it is, I think I still wouldn't know what it is. Actually, I'm not sure I know what it is regardless. By the way, it has been a long time since I have eaten Oreos of any flavor. OK, now another sip of milk before trying a Wasabi Oreo. Wow. Just wow. Unlike the Hot Chicken Wings Oreos, there's no mystery here. 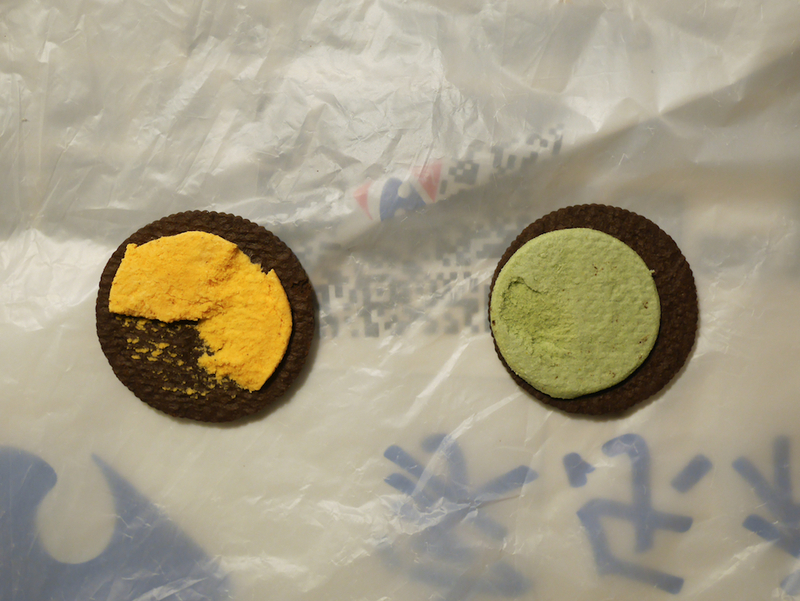 This was undoubtedly a Wasabi Oreo. The kick isn't as strong as the wasabi that comes with your sashimi, but the flavor is clear. Now just the filling . . . Again, not sweet, but I wouldn't use it with sashimi. Like before, I prefer it with the wafers more than on its own. Finally, I will try something the Oreo folks might not condone. I will eat half a Hot Chicken Wing Oreo and half a Wasabi Oreo at the same time. Hey . . . that was a zillion times better than I expected (note: I had expected a near complete disaster). And it tasted like nothing I have tasted before. The final verdict (for today): The Hot Chicken Wing Oreos were better than I expected. I don't find them gross, though I can't recommend the creme on its own. The Wasabi Oreos fit with my expectations, and I could imagine they have addictive potential. I wish I could say more about the improvised combo version, but I can't. It's like seeing a new color for the first time. In short, while I expect some people wouldn't like either of these Oreo flavors even if they gave them a fair try, I definitely can now see how some people will like one, both, or even the combo. I don't think I'm giving away my remaining Oreos. Last Wednesday I boarded a long-distance bus in Ganzhou, Jiangxi. After the bus left the station, the man who had just moved to the seat in front of me began watching a loud action movie on his mobile phone without using headphones. After considering the early morning time and world peace, I inquired as to whether he would be willing to turn down the volume. He was. And shortly afterwards he stopped watching the movie. During the long journey, he watched video on his phone a few more times but always at a low volume and not for extended periods of times. 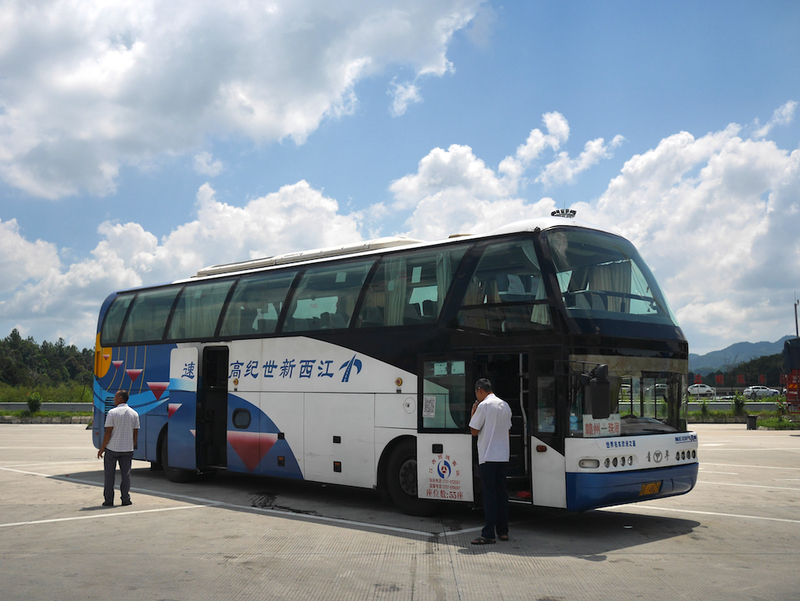 About four hours into the journey the bus and its approximately 15 passengers stopped at the Lütian Service Area at the side of the toll highway. I bought a chicken leg and some beef balls for 20 yuan (about U.S. $2.90) — pricey but such things can happen at a highway rest stop. 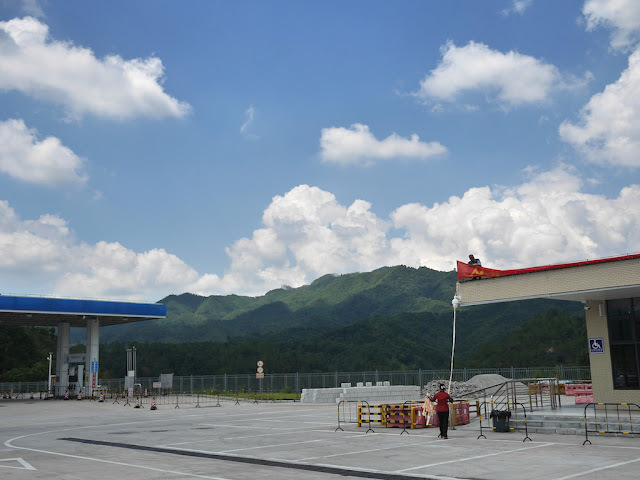 Otherwise, as far as highway rest areas in China go, it was unremarkable. But the rest area at least offered a pretty good view. I later learned that Lütian is a town in Conghua, a district in Guangzhou. Honestly, at the time I had no clue I was already in Guangzhou. 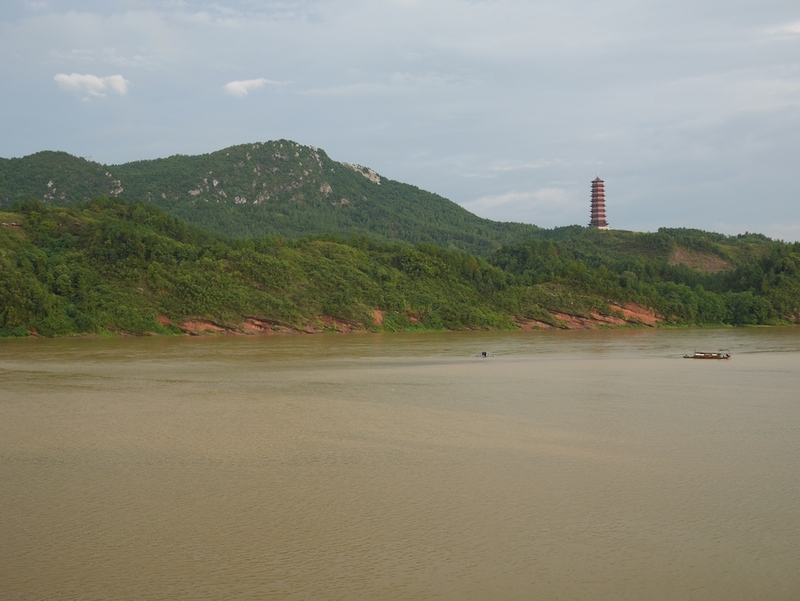 I will forgive myself since this mountainous area is over 100 km (60 miles) from Guangzhou's central urban areas. 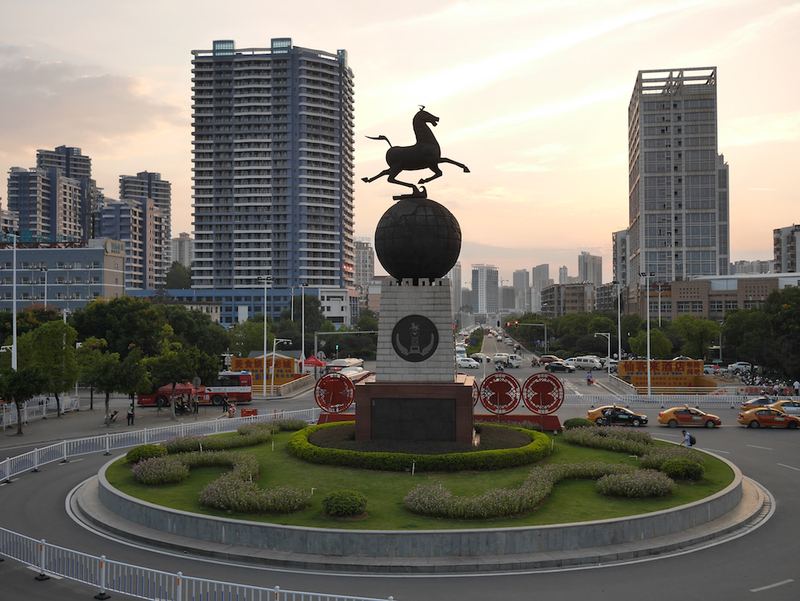 After a 7.5 hour journey, including the 20 minute rest stop, we arrived in Zhuhai — a city on the Guangdong coast I have posted about many times in the past. 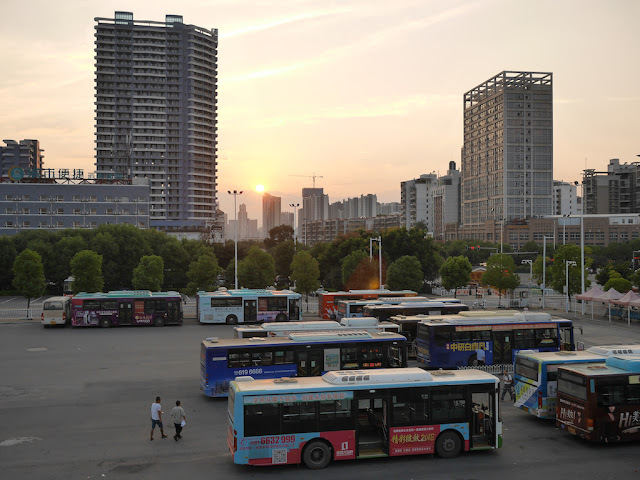 We could have arrived more quickly, but the bus also makes a stop in neighboring Zhongshan — another city featured in many past posts here. Overall, the journey was comfortable, especially since we all had room to spread out on the bus. 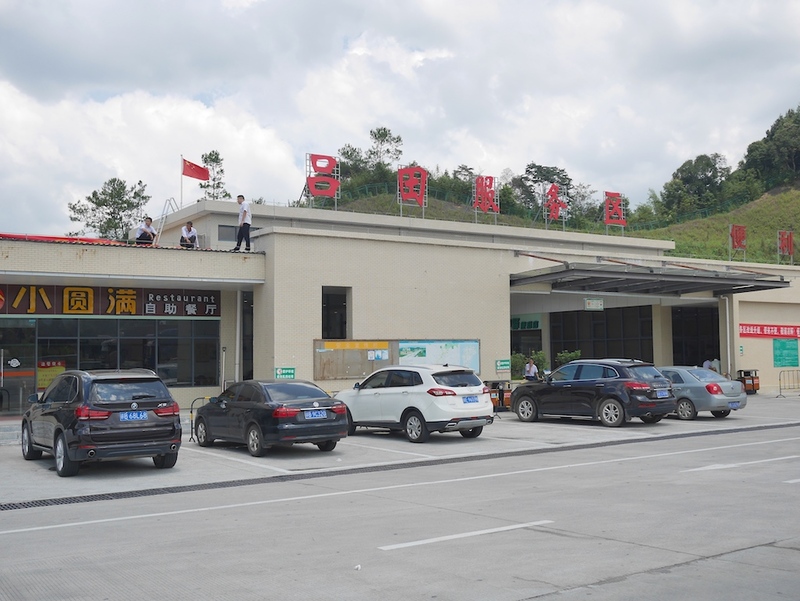 And it was more convenient than taking a train, which would have taken about the same amount of time, likely have been less comfortable during at least one leg of the trip, and have required transferring between far away train stations in either Shaoguan or Guangzhou. One motive for taking the train and transferring in Guangzhou, though, would be a lower price if 2nd class seats were purchased on both trains. There's still much I want to share about Ganzhou. Some things I held off on because I first wanted to explore as much as I could there. So more about the city and life there is on the way. 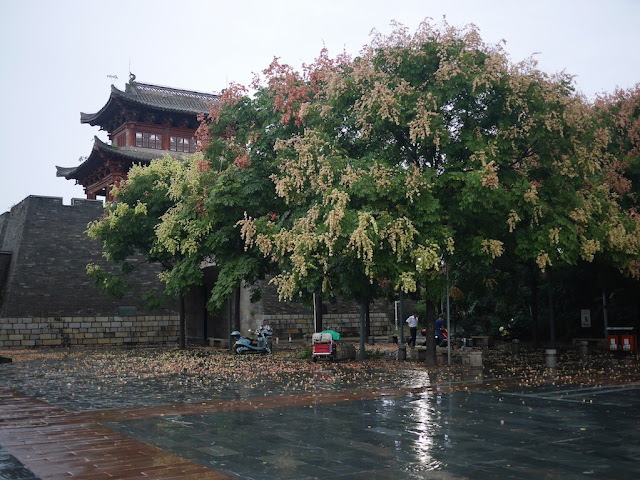 I wanted to share this travel experience, though, because it offers some clue for why this blog has been quiet for a few days and it helps explain why some non-Ganzhou-related posts may soon appear here as well. Earlier I posted several photos taken at Ganzhou Park. I can honestly say that at the time I had no expectation I would still be in Ganzhou over a month later. Fortunately, and not unexpectedly, the additional time has allowed me to discover much, much more than I would have otherwise. 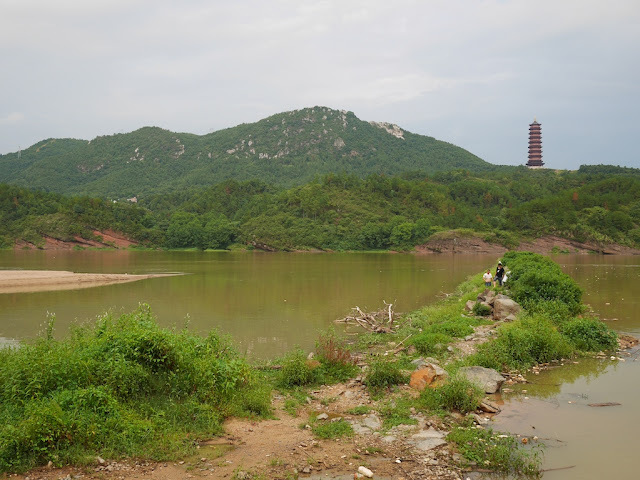 So on that note, here is a view from a hill path I had not explored until yesterday at Ganzhou Park. Last year I documented the effects from a typhoon directly hitting Zhuhai and Macau. More recently, Typhoon Mangkhut has left a mark in the Philippines and in China, especially the former. Most of the reports about the China region I've seen from Western news organizations focus primarily on Hong Kong despite the center of the storm hitting a point further to the southwest in Guangdong. While not dismissing the newsworthiness of some of what was reported, it struck me as an example of how news from this region can sometimes have a Hong Kong bias similar to the Beijing bias for China as a whole. Anyway, late this afternoon in Ganzhou, far enough from the sea and the storm, there was a brief strong thunderstorm. The effects I saw were relatively insignificant though. Yesterday's post included a photo of chili peppers being ground up in Ganzhou. 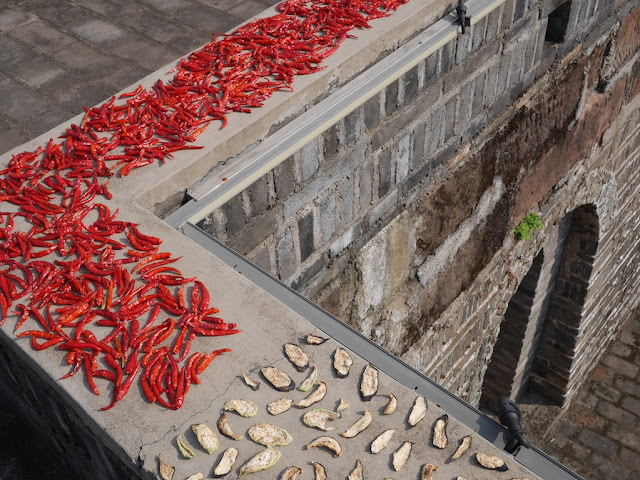 The theme now continues with chili peppers sun drying on Ganzhou's ancient city wall. I didn't try any of them then. But I can't rule out I didn't unknowingly do so later. Had I known, it would have made the experience all the better. 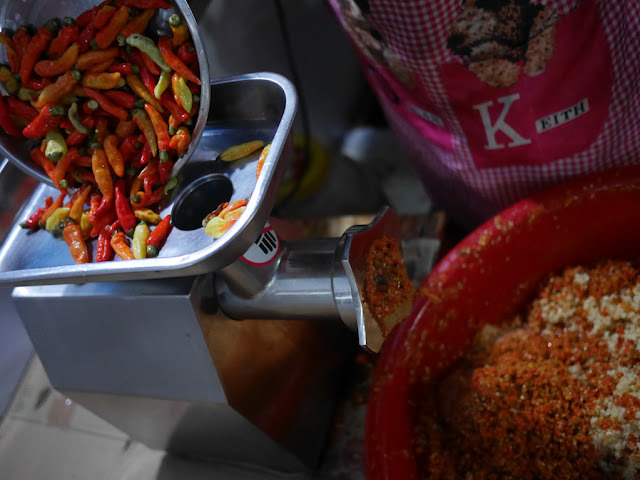 When I eat at a place that specializes spicy food, which is most places in Ganzhou, I respect when they make their own chili sauce. Good local food here. More about it another time. Yesterday around 6 p.m. 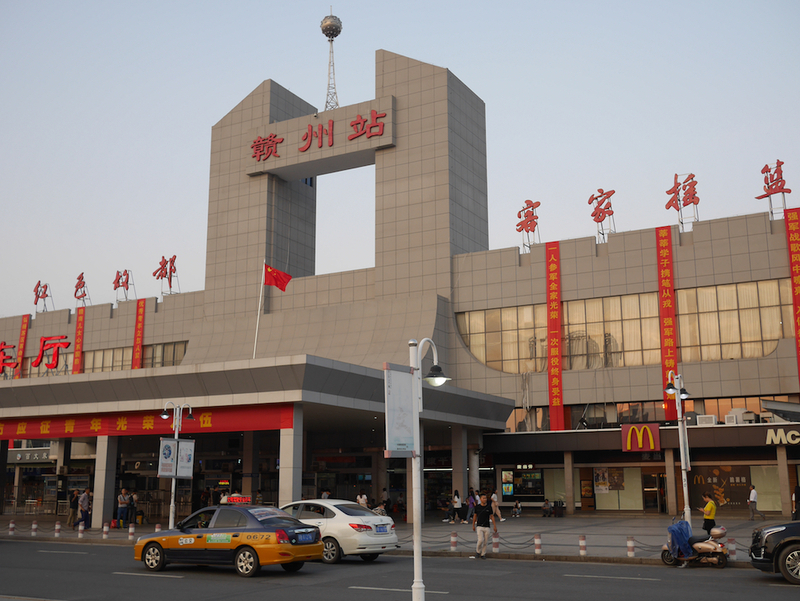 I stopped by the Ganzhou Railway Station to take a closer look at it and the surrounding area. Upon arriving I found a location safe for standing with a mostly clear view of the station and a large sculpture of a horse in front. 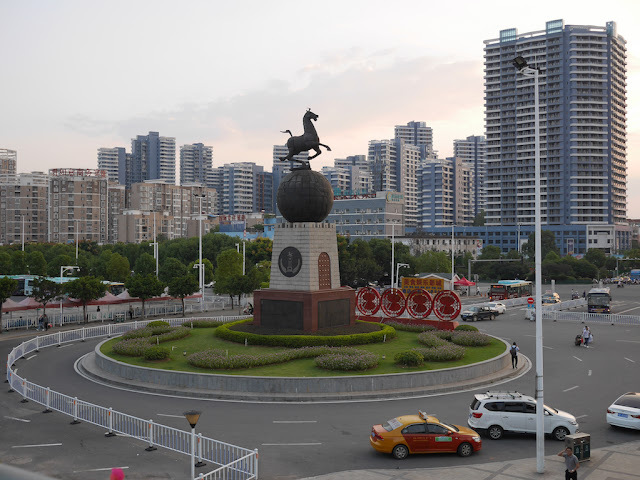 The horse is based on the iconic Flying Horse of Gansu bronze sculpture and a symbol for the China National Tourism Administration (CNTA), which recently merged with the Ministry of Culture to form the Ministry of Culture and Tourism. 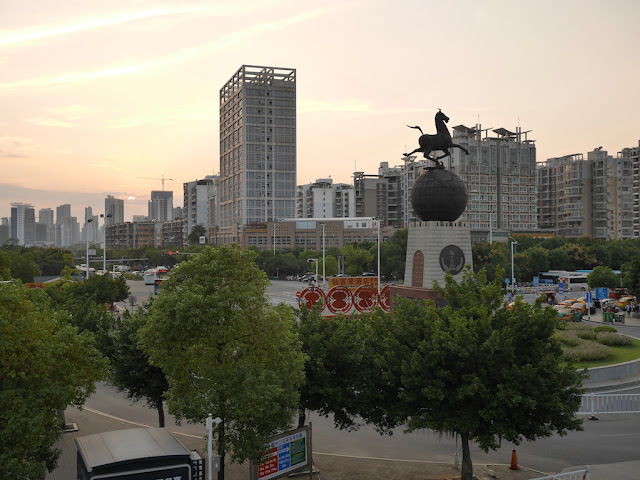 The plaque on the base of the structure indicates the CNTA identified Ganzhou as a "Top Tourist City of China". Just before lifting my camera, I heard a loud whistle behind me and turned around. A man driving a truck had turned into an area designated only for buses and a police officer was trying to stop him. The mistake seemed understandable, and I expected the driver would soon change course. He didn't. Instead, after slowing down and showing clear awareness of the officer, he drove onwards. When the officer went running after the truck, it quickly accelerated. The man then drove into an area partially blocked by a gate. A number of other police immediately became involved, but most of them didn't continue chasing the truck. They knew something the man possibly did not. There was no other way out. Unsurprisingly, the truck soon returned. Surprisingly to the driver, the police had completely blocked the road. The man chose not to go all Dukes of Hazard, and the police questioned after he had stopped. This was not a great development for the man. Or me. With all the action now in the scene I had hoped to capture and plenty of police eyes about, I didn't know a) if me taking a photo would attract attention and b) whether the police would then question me. All I really wanted a photo of the statue and station and not create more of an event, so I waited. The man initially tried to laugh the matter off. The police didn't laugh. They then appeared to ask for ID. Things proceeded rather peacefully after that, but there was no sign of when it would all end. So, I eventually gave up and quickly took two photos. Fortunately, one turned out decently enough. Also nice, nobody approached me. As I walked away, I noticed they had allowed the man to depart. Especially for a person who had just explicitly ignored police orders and tried to evade them, the issue had been handled rather calmly and efficiently. The rest of my time at the station passed by far more mundanely. Below are a few more photos I took of and from the station, some including the hard-to-miss horse. Train stations in China can be rather lively places, but at the time the station seemed relatively subdued. But at least the setting sun added some color. After hearing a startled scream at the the Zhonglian Shopping Center (中联商城) today, I saw a bear making sudden sharp movements with its arms approaching two young women. 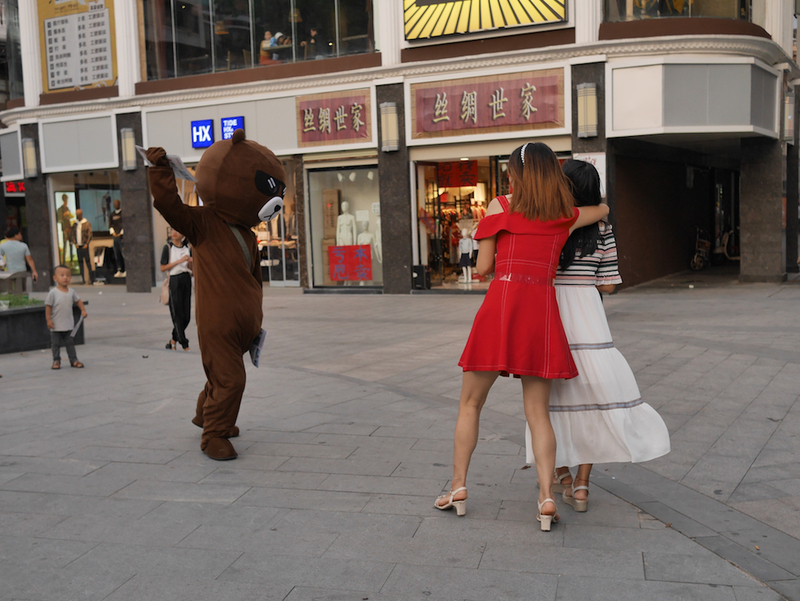 Of course I did the only thing possible and captured several moments which followed during which the young women refused the bear's offering and fled. Fortunately, nobody was injured (and nobody was in any real danger). The two young women walked away laughing at times. They also made sure the bear didn't follow them. 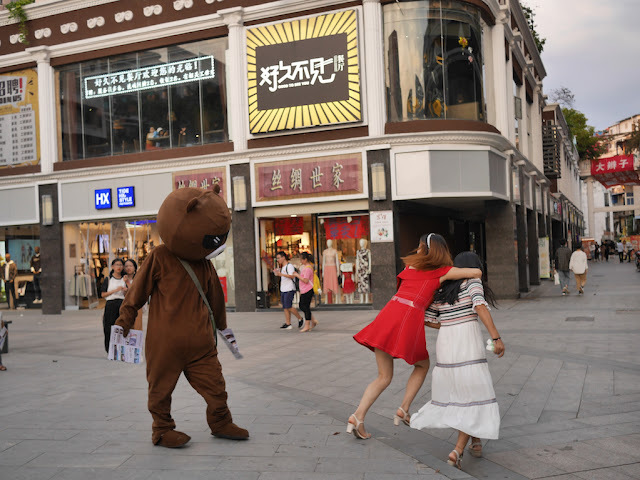 The bear left them alone after that, though, and appeared frustrated in this instance it had failed its primary task — handing out flyers. The aggressive approach the person used wouldn't at all be common or accepted for a person in normal attire, but putting on a costume can open doors for performance. I have seen similar suited tactics before in China and have wondered how much of it is the result of the person genuinely believing it could be effective versus the person simply desiring to entertain themselves or others while performing a potentially monotonous or frustrating job. In any case, as I left the shopping center I now had new question in mind. What would occur if this bear teamed up with Ganzhou's dancing Tyrannosaurus? There are several (OK, much more than several) pieces I have been keeping in open browser tabs, so I could write about them some day. In part since I am fearing they will become buried and I haven't done an assorted links post in a while, below are several of the pieces below with links and an excerpt. 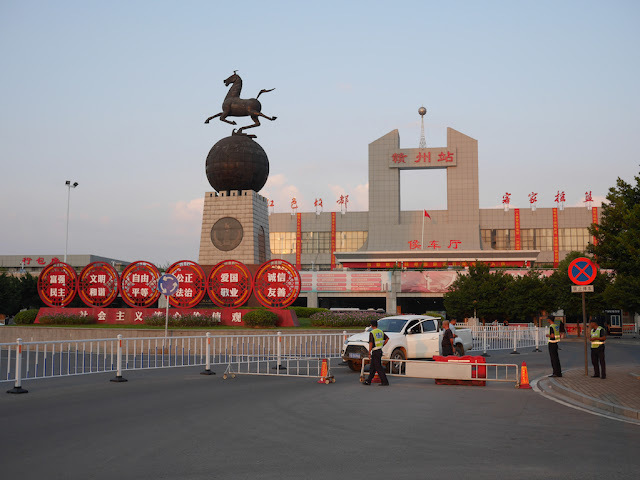 When she entered China surreptitiously in September 2011, there were no border guards, no checkpoints. They walked across a shallow creek in broad daylight. In Yingjiang, after eating a bowl of noodles for breakfast at a local restaurant, Marip Lu began to feel dizzy. Soon, her vision blurred. Then everything went black. When Marip Lu regained consciousness, she was slumped on the back of a red motorcycle racing down a highway, a chubby Chinese man holding onto her with one hand. Rubbing her eyes, she saw rivers and flower parks flashing by. Then things she'd only seen in movies: twinkling skyscrapers with vast crowds walking between them like ants. When she reached for the phone in her purse, she noticed it was missing along with her Myanmar identification card and the handful of Myanmar kyat — worth only a few U.S. dollars — that she'd brought. Suddenly, she understood. She'd been tricked, then drugged. And now, she was being trafficked. Almost three weeks after a United Nations official cited “credible reports” that the country was holding as many as 1 million Turkic-speaking Uighurs in “re-education” camps, governments in Muslim-majority countries have issued no notable statements on the issue. The silence became more pronounced this week after a bipartisan group of U.S. lawmakers urged sanctions against senior Chinese officials. . . . The silence on Uighurs contrasts with outrage last year when some 700,000 Rohingya Muslims fled clearance operations by the Myanmar military, which the UN has since likened to genocide. One big difference between the two cases: Myanmar’s economy is 180 times smaller than that of China, which is the top trading partner of 20 of the 57 member states of the Organization of Islamic Cooperation. They use code words to evade government scrutiny. They communicate on messaging apps using end-to-end encryption. On the heavily-censored messaging platform WeChat, they send images of articles, rotated and distorted with shapes and squiggles that can trip up text recognition functions. When online censors tried to scrub a letter Yue posted on WeChat in April about being pressured by her university, fellow students used blockchain technology to ensure it remained accessible. The inimitable @azadessa's weekly column in South Africa's paper, Independent Media, has just been cancelled because he wrote a piece on China's internment of the Uighur minority. This is @azadessa's full post with the news of his cancelled column because he wrote about China's internment of Uighurs. 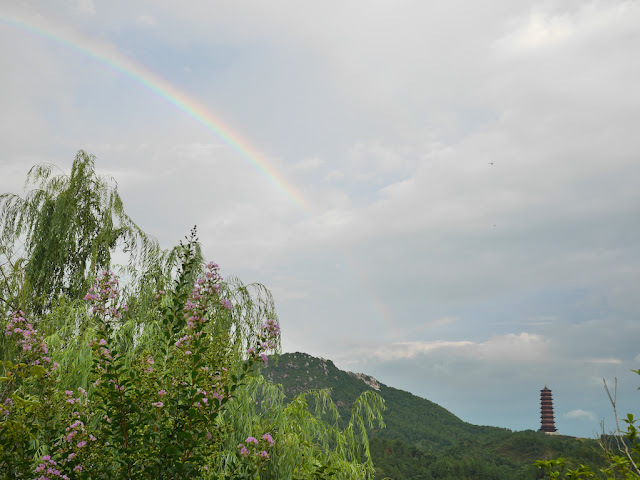 A little over a week ago in Ganzhou, I saw a rainbow — an uncommon experience for me during my years in China. Seeing the rainbow was all the more surprising because I hadn't noticed anything which made me think one was a likely possibility. Later in the week on Saturday, I visited Ganzhou's Ganxian District (赣县区). A storm passed though during the afternoon, and as the rain subsided I thought it could be a prime opportunity to catch yet another rainbow. 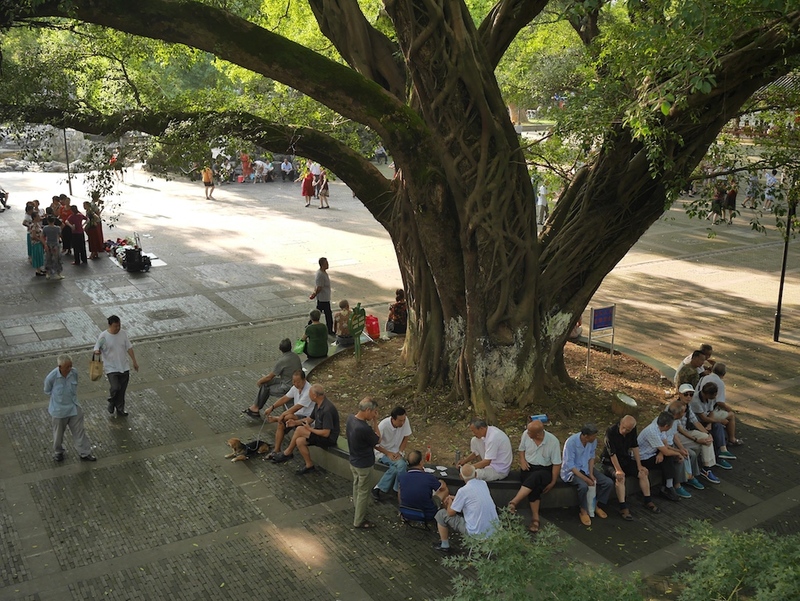 So I headed eastward down a tree-covered section of Meilin Street (梅林大街) to an intersection with a clearer view. 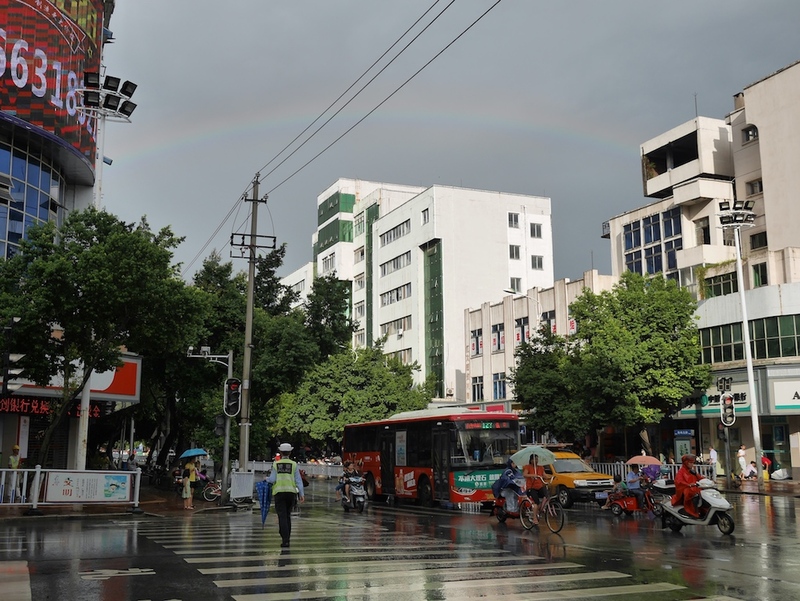 I hadn't ever seen two rainbows in such a short period of time in China. Looking further down the road, it appeared there might be some natural scenery to pair with the rainbow. So I changed plans and headed in that direction. By the time I reached the perimeter of Ganxian's most urban area, the rainbow was gone. 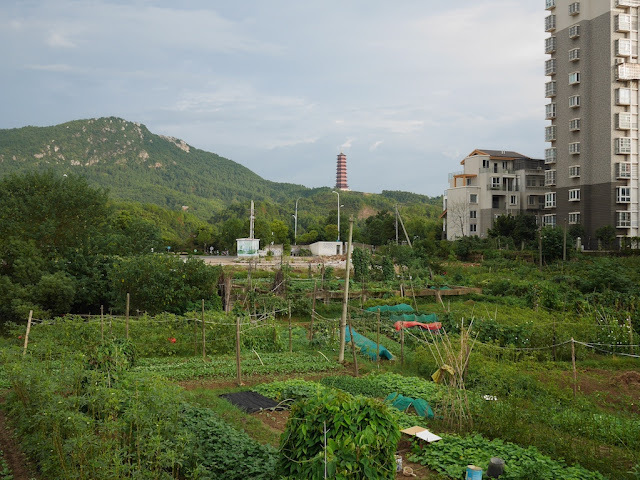 Yet the view was still rewarding, and I spotted the Zhenxing Pagoda (振兴塔) in the distance. Now intrigued by the tower, I headed toward it. 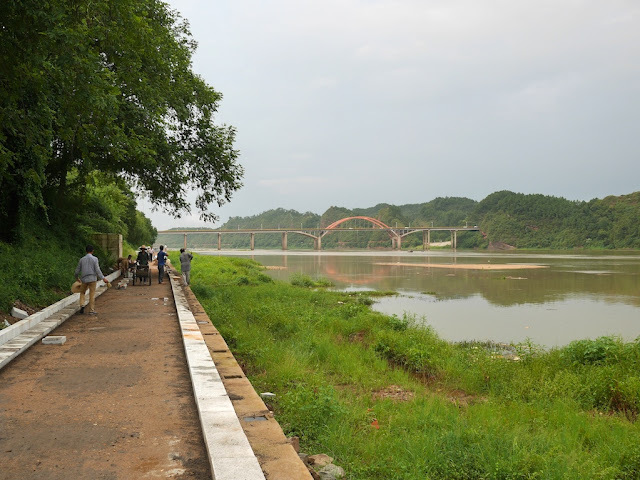 Soon I was at the Gong River (贡水), the same river where I had earlier seen people observing the Hungry Ghost Festival in Ganzhou's Zhanggong District (章贡区). 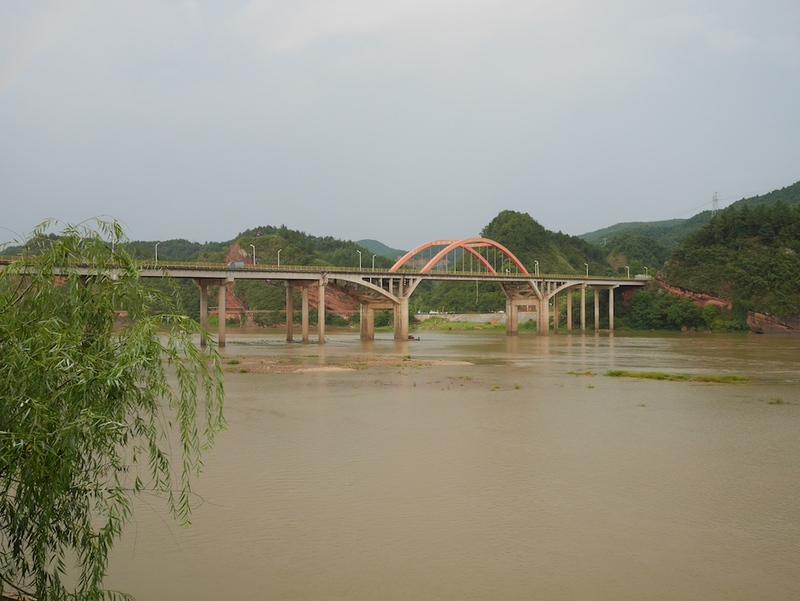 Nearby I spotted the Meilin Bridge (梅林大桥). 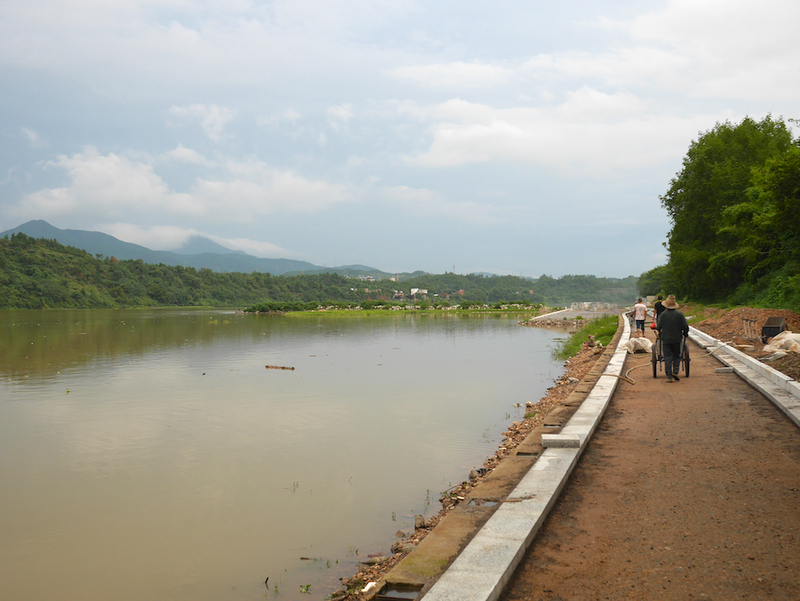 I then headed down to the riverbank where I took in more views and also saw construction work on a riverside walkway. The previous time I saw a rainbow, I had to give thanks to a woman for the fact I saw it all. This time, I had to give thanks to the rainbow for bringing me to sights I would have likely missed otherwise. And I still ended up making it to my original destination, which I could fortunately appreciate even after the sun had set. One more thing . . . While I had been walking near the river, there was a brief drizzle and a rainbow appeared once more. I wasn't in an ideal location during its brief existence. But nonetheless, I finally captured a rainbow in a more scenic Chinese setting. 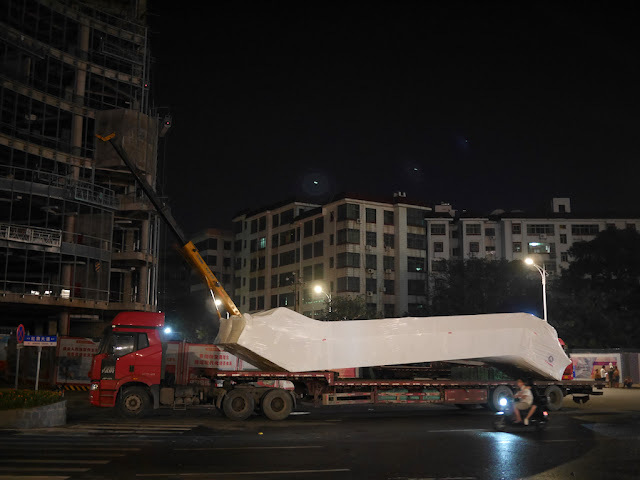 Two nights ago I posted a photo of one of the trucks delivering escalators to a shopping mall construction site in Ganzhou. I thought it would be interesting to see an escalator make the journey off the trucks. But nothing seemed about to soon happen, so I continued onward somewhat disappointed. Unexpectedly late last night, though, I happened to pass at just the right time and struck gold. Never got to see that before. Maybe someday I can get into a construction site to watch the rest. 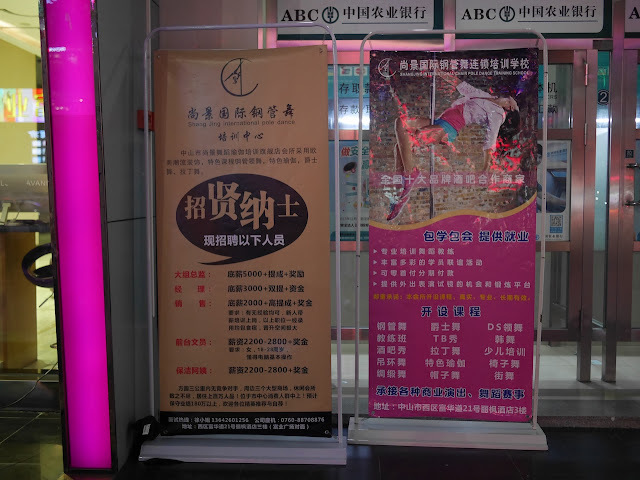 Six years ago I met a college student working part-time handing out printed advertisements for a pole dancing school in Changsha, China. Later, I met another student doing the same. After asking a few questions about the school, she invited me to take a look myself. Soon I was having an enlightening conversation with a manager during my first visit to a pole dancing school. Since then, in a number of other cities in China I have come across signs of more pole dancing schools, and the activity's popularity has grown as a way to stay physically fit while enjoying oneself. 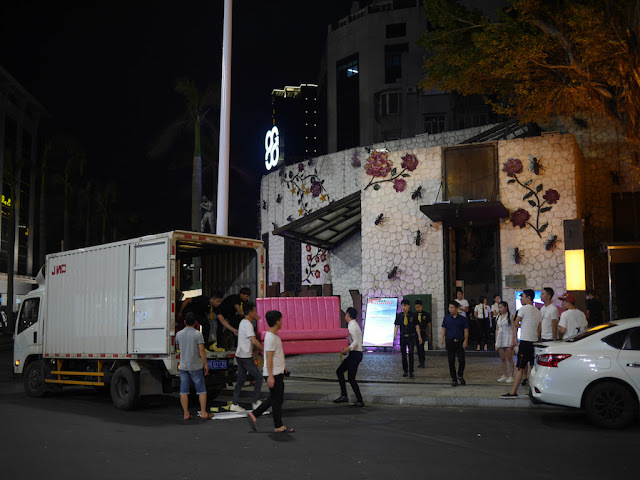 Although pole dancing occurs in some locations, such as nightclubs, where it can more typically be found in the U.S., there are differences between the two countries in how it is perceived. 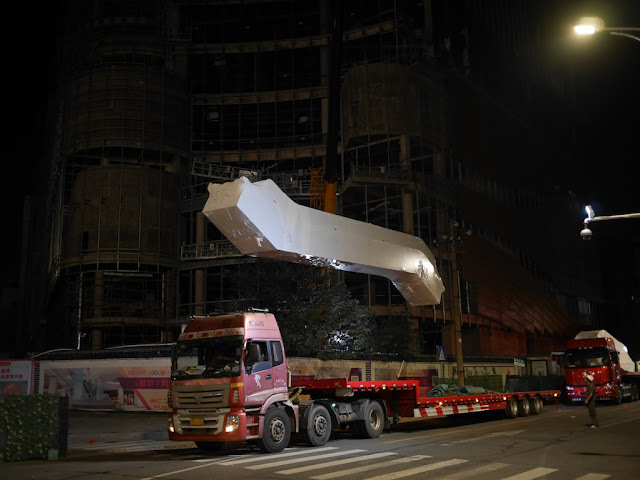 Still, when I first saw a remarkable tweet today from Michael Standaert, a freelance journalist based in Shenzhen, indicating his children's kindergarten had put on a pole dancing show for the young students on their first day of school, I wondered if it was some sort of joke. Below are most of Standaert's tweets on the topic, including videos of children watching pole dancing performances and some of his replies to others' comments. The tweets are from multiple threads and presented in the order they were tweeted. Read to the end to learn the school's decisive response. It looks like opening day will be a bit different next year. I think she really has no understanding of the connotations of pole dancing in other countries. Yes of course it has taken off as an exercise fad for adults, but the leap from that to performing herself and inviting a troupe in for about 200 little kids? To update: We met with a representative of the company that owns this school and several other schools. An understatement to say they've been getting a lot of complaints today. She told us that the principal is being removed and will be replaced, but that it will take two weeks. All the pole dancing and military stuff [actually a lot of parents were supportive of the latter] was all the idea of the principal, we are told. Our kids are pretty happy with their homeroom teachers. So it looks like we may stay there, but will take a couple weeks to resolve. At least this school doesn't give much homework. My daughter might want a pole in the living room. The principal did one dance. The other dancers are supposedly from a pole dancing school that the principal belongs to. I'd seen her post some things on her own Wechat recently about it. 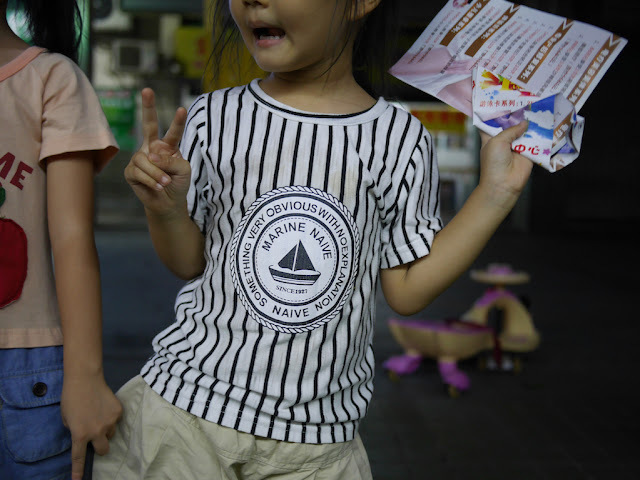 But no idea that she was going to bring it to the kindergarten. Funny you mention this. I was told by my landlord that the park where I run most days used to be where they did public executions in these parts, 30 years ago. Another update before I run out of power. The principal has been fired. The Bao'an education authorities acted quite quickly.